This article discusses how to track crowd-sourced real estate investments in software like Quicken or iBank. Investment returns of the average investor — What happens when you don’t stay the course. In my book, Money for Something we discuss how important it is to “stay the course.” Most people, however, don’t stay the course, and this chart from the J.P. Morgan Guide to the Markets illustrates the astounding consequences. Continue reading Investment returns of the average investor — What happens when you don’t stay the course. Posted on April 10, 2015 December 25, 2015 Categories MoneyTags InvestingLeave a comment on Investment returns of the average investor — What happens when you don’t stay the course. We live in an age in which the responsibility for providing for one’s financial needs during retirement mostly lies on the individual. A historically successful approach involves persistent saving and investing according to the fundamentals introduced in my book, Money for Something. This article looks specifically at asset allocation over one’s lifetime. The power of compounding interest can be understood through the “rule of 72”—i.e. the number of years it takes to double your money is approximately equal to 72 divided by your rate of return. For example, assuming your invested savings compound at a rate of 7%, you would double your money every 10 years. Especially important for young people, this same rule highlights the opportunity cost associated with spending, rather than saving. That means one dollar spent today would be worth $2 in 10 years, $4 in 20 years, $8 in 30 years, etc. So if you’re twenty years old, just remember that when you spend $40,000 on that new car, instead of $20,000 on a used one, you’re potentially giving up $160,000 in retirement savings! To learn more about investing, be sure to check out my book, Money for Something. It can be read in less than an hour. So much of the financial services industry’s value proposition resides on the premise that markets can be beaten. With the most talented managers, the best research and cutting edge processes and algorithms, the modern financial firm promises to get you ahead, in exchange for fees that would otherwise kill long-term returns. 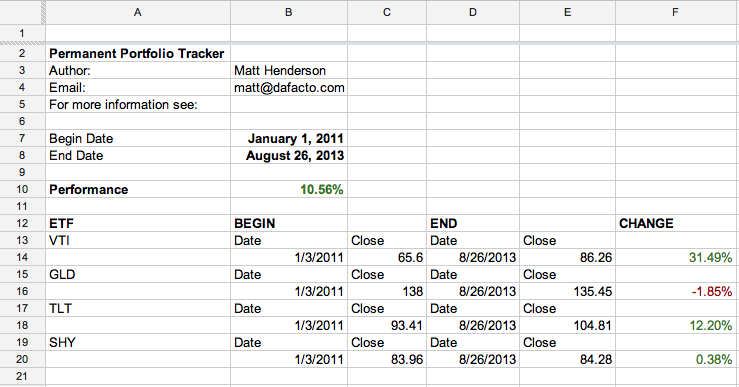 Using software like Quicken or iBank, I’ve always budgeted, tracked and monitored our family’s expenditures by category. In this area, the internet age has delivered both improvements and setbacks. My book Money for Something, was released in August of 2012. While the intention of the book was to teach the simple fundamentals of investing, I decided to go one step further, and describe the specific asset allocation in which I personally invest—known as the Permanent Portfolio, that includes stocks, bonds, gold and cash. Of the blogs I read, many are from authors who’ve become popular enough to monitize their sites, through memberships or advertisements. Those authors now have to publish on a regular schedule; not just when they have something to say. I noticed this morning that, as consequence, the majority of posts in my RSS reader are uninteresting, even though they’re written by otherwise very interesting authors. Today I created a publicly-accessible Google Spreadsheet that calculates the performance of the Permanent Portfolio over a range of dates. About a year ago, I opened a checking account at Simple.com and made a small deposit. I’d seen a lot of chatter about the new service and its plan to fundamentally change personal banking, and wanted to give it a try. On the positive side, I really, really appreciated the effort they put into the design of the user experience. They also did some interesting stuff like geo-tracking my debit card transactions. On the negative side, I missed basic things like being able to download monthly statements for reconciliation. And as someone who spends more time outside the US than in, I missed having access to foreign-transaction-free credit cards and fee-free foreign ATM access, like I get from other American banks. At the end of the day, though, Simple seemed primarily intended as a personal-finance tool, helping people maintain goals and budgets—services I don’t personally need (as I do budget tracking elsewhere). This week, realizing it’s been months since I’ve even logged into Simple, I decided to close my account. When I logged in, Simple showed my available balance as $5.72. Manually adding up my transactions, though, the balance came to $15.06. When I emailed customer support, they reported that indeed my balance was $15.06, and speculated that the website is displaying the wrong balance since my account has been inactive for several months. Hmmm, that doesn’t inspire much confidence! A friend contacted me recently with concerns about the fact that his Permanent Portfolio is down about 2% since he started investing about eight months ago. I am much more likely to support bank depositors bailing out a bad bank than everyone else that was not a customer (taxpayers). He also mentioned that New Zealand are preemptively planning a similar banking crisis solution. Economic news from Marbella—good or bad? Our office is located in the “industrial” side of Marbella; an area which is separated into two distinct “zones”, divided by the main road that runs through town. We’re located in the “lower” zone, between the main road and the beach. The majority of businesses are located on the other side of the road in the “upper” zone. Clearly, this was great economic news for the city of Marbella, and potentially great economic news for us real estate owners, depending how we would be compensated for our properties. During the next few years, as expected, there was very little buying, selling or serious renovation of any of the commercial buildings in this area, given the knowledge that at some point in the near future this entire zone would be leveled to make room for the new port. Recently, though, there’s been rumors of delays in the port project and potential contractual issues with the city. These rumors took on some credibility when I noticed somebody had taken out a new lease on an entire building and completely cleared it out—effectively unifying six independent offices. That somebody turned out to be Peugeot, who decided to move their presence in the “upper” zone to directly across the street here in the “lower” zone. Judging by the quality and extent of the build-out work they undertook this was a serious investment for the car company, and so I’m guessing they know something that gives them confidence they’ll be able to stick around for a while. 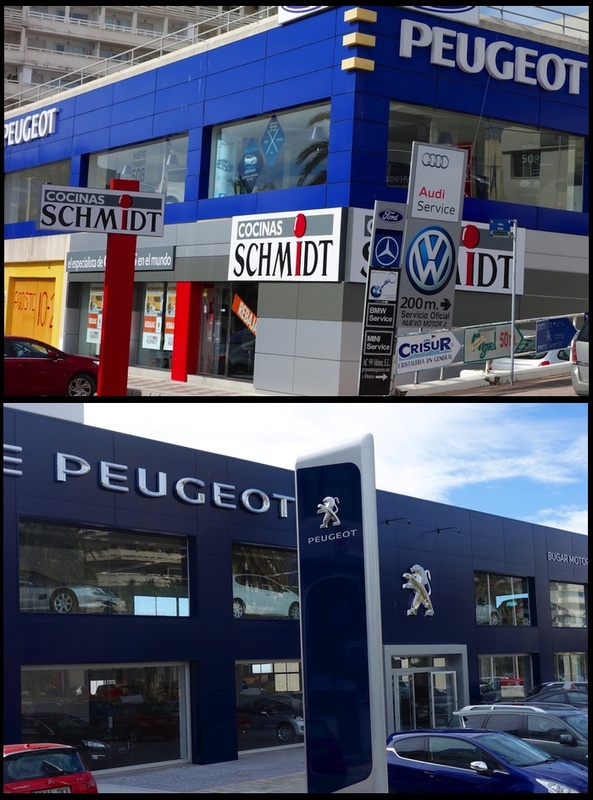 In a time when positive economic news is extremely rare here in southern Spain, it’s certainly good to see a company like Peugeot make a big investment. On the other hand, this could be bad news in the larger sense that we’re probably unlikely to see a new port in Marbella. Posted on January 28, 2013 May 25, 2015 Categories MoneyTags Spain2 Comments on Economic news from Marbella—good or bad? In Money for Something, we talk about viewing wealth in terms of the income it can generate — i.e. in terms of the four percent rule. Based on a number of studies to determine a reasonable “draw-down” rate for retirees, there’s a rule of thumb which states that if you withdraw no more than four percent of your sensibly-invested savings per year, you’ll likely never run out of money. So, if you could live on $40,000 per year, then you’d be financially free once you’d saved and invested an amount of one million dollars — regardless how old you are. Interestingly, this rule of thumb can also be used in reverse. The other day I was speaking with a retired couple who, from their employer-provided individual retirement plans (to which they contributed during their working careers), receive about $6,000 per month, for as long as they live. Talking to them, it was interesting to hear the husband ponder what he’d do, if he were “a millionaire”. Well, in a sense, he is! Based on the four-percent rule, how much would you need to have saved to generate an income of $6,000 per month? — $1,800,000! Understanding how to view wealth is just one of several important aspects of money management. For a complete and easy-to-read introduction, be sure to pick up a copy of Money for Something today. How often should you check your investment portfolio balance? Some have even setup auto-updating Google Spreadsheets, allowing them to track their investment balance with up-to-the-minute accuracy! Although a well-structured investment portfolio should, over the long-run, increase in value, it will, on a day-by-day basis, likely go up or down with about the same probability—with “up” being slightly more likely. The new field of behavioral pyschology tells us that we humans tend to feel more pain when we experience a loss, than pleasure when we experience a gain. The consequence is that if you check your portfolio on a daily basis you will, cumulatively over the course of a year, likely feel more pain than pleasure. And that certainly doesn’t help in achieving the real objective — sticking with your investment plan over the long-run. So, what’s a good frequency to check your portfolio? Personally, I’d love to have the discipline to check mine only once per quarter. But that’s hard to do, and so I’m pretty happy if I can limit myself to once per month. Posted on September 18, 2012 July 4, 2013 Categories MoneyTags InvestingLeave a comment on How often should you check your investment portfolio balance? How much should you learn about investing? Many years ago, I learned the fundamentals of investing, and over two decades of consistently following them, confirmed that (at least for me) they worked exactly as advertised. Over the years, though, a questions I’ve asked myself many times is how much investing knowledge should the average person have? Have I learned more than necessary? Have I not learned enough? Continue reading How much should you learn about investing? Although people often state financial independence as a personal goal, few with whom I’ve spoken can articulate what that means. (And even fewer know precisely how to get there.) It’s a lot easier to work towards an objective, when that objective is precisely defined. Posted on September 13, 2010 January 20, 2016 Categories MoneyTags Investing4 Comments on Financial independence. Each person who makes the decision to save, must decide where to store his savings. This article introduces the “Permanent Portfolio,” in which the late Harry Brown recommended to store that portion of one’s savings that is considered precious. Cash in a bank will lose value over time due to inflation. Value in a real estate isn’t very liquid. Money invested in a company’s stocks can be lost in a bankruptcy. In general, modern investment theory speaks with a uniform voice—we should allocate our savings across a diversified mix of (ideally uncorrelated) assets. But which assets? Almost all of the leading investment experts (Malkiel, Bernstein, Bogle, etc.) recommend that we allocate our savings primarily across stocks and bonds. Within this camp, a few peripheral voices recommend mixing in small quantities of alternative investments such as commodities or real estate investment trusts, for their diversification benefits. In addition, the particular proportion of stocks and bonds is important, as it defines one’s expected “risk” level. A portfolio of 80% stocks and 20% bonds will provide far greater opportunities for gain than a portfolio of 20% stocks and 80% bonds. At the same time, however, it also provides opportunity for far greater loss. The experts insist that each individual must assess his own level of acceptable risk when choosing a particular allocation, and that we must monitor and adjust accordingly over time, as we get older or as our circumstances change. First, the particular assets of stocks and bonds have been chosen because of their historical relationship. For as long as we’ve had data available (more than 100+ years), a mix of stocks and bonds would have outperformed other passive investment vehicles available to us. But, what if the future doesn’t look like the past (at least within my lifetime)? Second, it is well known that humans have a terrible track record in the assessment of risk. It’s a much, much more complicated issue than answering a few cookie-cutter questions about what you’d do if the market tanked. Furthermore, investment experts such as William Bernstein point out that there’s actually three components of risk that investors need to evaluate—tolerance for risk, capacity for risk and need for risk. An alternative—the Harry Browne “Permanent Portfolio”. Protection. We don’t want to lose our savings, under any circumstances. Growth. If possible, we should try to grow our savings, at least enough to compensate the erosive effects of inflation. Prosperity—In times of prosperity, stocks perform well. According to the principle of diversification, he recommended (as do most experts) investment in low-cost, passively managed mutual funds or ETFs that track broad market indicies. Inflation—In times of strong inflation, when the purchasing power of our paper currency is being eroded (and in times of political or currency crisis), gold does well. He recommended owning physical gold, although owning it in a more convenient alternative (such as an ETF) is also acceptable. Deflation—In times of deflation, when interest rates and prices are dropping, the value of bonds increase. The sensitivity of bond prices to such conditions is a function of the bond duration—the longer, the better. Furthermore, we need to be holding bonds that can’t be called. In such times, we therefore need to be holding long-term government bonds—e.g. 20-year US treasury bonds. Recession—In times of recession, almost all investments decline. During such times, we need a cash cushion to sustain ourselves, and with which to buy up those other assets that are temporarily dropping in value. Browne recommended that we divide our savings equally among those four assets, and periodically sell those that are doing well, and buy those that are doing poorly—a critical process known as “rebalancing”—in order to maintain that equal 25% distribution of savings across each. This portfolio, known as the Permanent Portfolio offers a lot to like. It is simple. It is permanent. It doesn’t require self-assessment of risk or time-frame. It contains at least one asset that should be doing well at all times, and which historically has carried the portfolio as a whole. Finally, through modern ETFs, it’s very easy to own this portfolio, at extremely low costs. But how does the Permanent Portfolio perform? How has the PP performed historically? Very well, in fact! Since 1964, the PP has returned an average of 8.5% per year; quite respectable compared to the 8.8% return of the common 60/40 stocks/bonds portfolio. But whereas the common stocks/bond portfolio lost 30% of its value in the crash of 2008, the PP lost only 1.3%. You might want to pause, to contemplate that last point. In fact, the Permanent Portfolio has prospered during both bull and bear markets, in a manner that has been very stable. In short, the PP has performed nearly as well as standard 60/40 portfolios, but with far less volatility. One might wonder, as I often have, why more experts don’t recommend the PP, and why more people don’t invest in it? As to the first question, why experts don’t recommend the PP, nearly every objection I’ve heard relates to an analysis of one of the PP’s components in isolation. Cash loses value due to inflation. 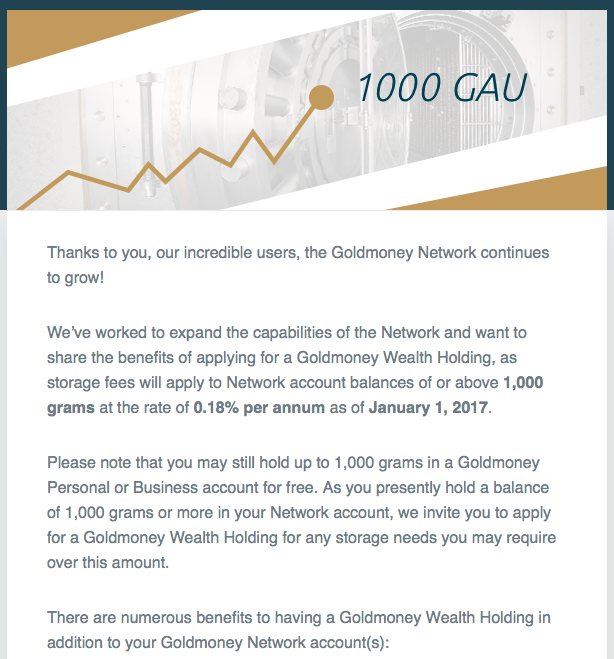 Gold offers no long-term return. Long-term bonds will get crushed when the government finally increases interest rates. Such analysis is fundamentally flawed in that it’s the portfolio that matters, not the individual components. The magic of the PP is the relationship these four asset classes to each other—i.e. three of them are both highly uncorrelated and volatile; essential ingredients in a winning portfolio. Gains are captured through rebalancing, and stability is achieved through dis-correlation. Regarding the second question, why more people don’t invest in it, the PP has a big issue working against it—tracking error. It’s ups and downs will not mirror those of the general stock market, and so when stock-heavy investors are boasting of their big returns in a given year, the PP holder will more likely than not be looking at more meager growth. For this reason, investing for the long-term in the PP requires determination and fortitude. That I have no problem with; I know I can stick with a plan. Interestingly, famed investor William Bernstein recently weighed in, publishing an article about the Permanent Portfolio, in which he refers to it as, “a thing of beauty.” In fact, the only problem he has with the PP is precisely what I mentioned above: It’s hard for most people to stick with it, over the long run. Reading that article made my day. Reconciling A Random Walk and The Great Wall. Dr. Burton Malkiel, professor at Princeton university, is one of my favorite authors on the subject of investing. His book, A Random Walk Down Wall Street, is considered one of the cornerstones of personal investing literature. In 2008, Dr. Malkiel published another book, From Wall Street to the Great Wall, in which he makes the case for investing in China. Having read both books, I was puzzled by the apparent conflicts between the two. Continue reading Reconciling A Random Walk and The Great Wall. Posted on June 3, 2010 Categories MoneyTags InvestingLeave a comment on Reconciling A Random Walk and The Great Wall. An overview of personal investing. In this article, I’m going to compress a lot of study, experience and opinion about personal investing, into a single essay to which I can refer others. Albert Einstein pointed to compounding rates of return as the strongest force in the universe. It’s the idea of earning interest on past earned interest, and is the basis of the Rule of 72, which states that 72 divided by the rate of return, is the approximate number of years required to double your money. Long term investing can dramatically grow the value of money. For any given period required to double your money, subsequent equivalent periods will result in your money multiplied by four, 16, 32, etc. The rate of return is important. At 5%, you will have quadrupled your money in about 29 years. At 10%, you will have quadrupled it in only 14. A person investing $250 per month, beginning at age 20, and earning 8% per year, will, having invested a total of $120,000, have accrued nearly $900,000 by age 60. If the same person started saving just five years later, at age 25, the accrued savings would be $573,000. Think about that—the first 35 years contributed $573,000, and the final 5 years almost $325,000! Clearly, for those interested in investing, it’s important to start early. There are lots of things in which one can invest: real estate, gold coins, painting, or a bank savings account. (Let’s call such things in which we can invest, asset classes.) Key considerations in asset class selection include costs, convenience, risk and expected rate of return. It turns out there are a number of asset classes in which one can invest, conveniently and with low cost, through a simple brokerage account, and which have traditionally delivered attractive rates of return. These include stocks, bonds and some other classes we’ll introduce a bit later. Each asset class in which one can invest can be characterized by its expected return, and its expected risk. Over the 76 year period from 1926 to 2002, bonds returned about 5.5% per year. But from individual year to year, they fluctuated within a range of plus/minus 9%. During the same period of time, stocks returned an average 10% per year, but from individual year to year fluctuated as much as plus/minus 21%. In general, time dampens the expected volatility of overall investment return. For example, we can look at various windows of time, invested in stocks, during the period from 1950 to 2002. 1 year. The worst return over any one year period was -26% while the best return was 52%. 20 years. The worst return over any 20 year period was 6.5% while the best return was 17.8%. While we know from the math of compounding rates of return, that the difference in the value of a dollar invested over 20 years at 6.5% and 17.8% is huge ($3.5 versus $26.5), it’s comforting to see that, in absolute terms, we wouldn’t lose money over any period 10 years, even having been invested in a relatively risky asset class like stocks. Combining uncorrelated asset classes (diversification) can work to both reduce volatility (risk) while increasing overall return. This point is very, very important, and is why asset allocation (the splitting of ones investments among (hopefully) uncorrelated asset classes is likely the most important aspect of investing. So what are some asset classes in which one can conveniently invest through a brokerage? It turns out, quite a lot! Commodities, including oil, wheat, corn, etc. While it may seem surprising, a long history of data clearly demonstrates that almost nobody consistently beats the market itself. While there are a couple of notable exceptions—like Warren Buffet—even these can be (at least) justified through simple statistics. If 1000 people flip a coin 10 times, you’re likely to have one person who gets a streak of 10 heads in a row. With millions of people participating in the market, statistically some will do well. But here’s the important thing: For an arbitrary investor with a historical record of picking individual stocks, it is statistically unlikely they will continue to do well in the future. The study of behavioral finance sheds some light on why acceptance of this notion can be so difficult. I myself have clearly struggled with it, often finding myself investing in a particular stock that I’m sure will go up in value. But my own personal experience has been absolutely consistent with the theory, at least insofar as my ability to beat the market. So how do we invest in the market as a whole? It’s very easy, through ETFs. In the 1990s (and before) people wanting to invest in the market as a whole generally did so through mutual funds that tracked market indexes, like the S&P 500. Towards the end of the 1990s, though, an even more convenient, lower cost tool emerged, the Exchange Traded Fund, or ETF. Today, from what I read, proportionally more investments are made through ETFs, and, indeed, many of the historical leaders in mutual funds (like Vanguard) are today’s leaders in ETFs. An ETF is a product, the shares of which can be bought and sold through brokerages, in exactly the same way that individual stocks can be bought and sold. However, they are similar to mutual funds in that a single share of an ETF effectively buys a fraction of each underlying company (or bonds, or commodities) in which the ETF invests. VTI, a Vanguard ETF that invest in all companies within the MSCI US Broad Market Index, including some 1,200 to 1,300 American companies. VWO, a Vanguard ETF that invest in companies within the MSCI Emerging Markets index, i.e. companies in countries like India and China. BND, a Vanguard ETF that invests in the entire American market of quality bonds. VNQ, a Vanguard ETF that invests in the broad American real estate market. 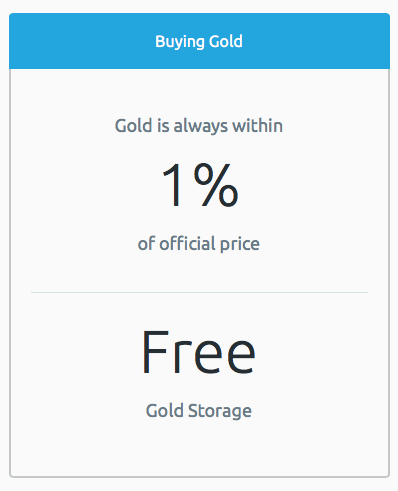 GLD, a State Street ETF that buys gold bullion. DBC, a PowerShares ETF that invests in the Deutsche Bank commodities index. It’s quite amazing when you think about it, that through a single brokerage account you can create a broad and internationally diversified portfolio of investments! It is here—in the definition of which asset classes one should include in one’s portfolio, and the percentages of the overall portfolio assigned to each class—where it seems nearly everyone has a different opinion. Some people suggest a simple split between stocks and bonds, weighted more towards bonds as one gets older. Others suggest complex allocations to small companies, large companies, US treasury bonds, bonds from the governments of emerging countries, and a little gold thrown in for good measure. If you Google for “asset allocation” you can spend days reading about different suggested asset allocations. The notion of rebalancing mandates that you sell enough stocks to bring its allocation back down to 40%, and buy enough bonds and gold to bring theirs back to 40% and 20%, respectively. The idea is that all assets move up and down over time, and so you are continually selling what has gone up, and buying what has gone down, such that in the long-run. You are buying more of what is cheap, and less of what is expensive, with the ultimate objective of increasing return while preserving the risk/return characteristics of the overall portfolio. As noted by many authorities on investing, rebalancing, while being one of the most necessary aspects of long-term investing, is unfortunately one of the most difficult to stock to in practice, because it requires that you commit to an allocation over time, and that you are continually investing in what is presently against the market sentiment. In terms of how often you should rebalance, many recommend rebalancing once per year. I recently read an interesting article by the manager of the Yale Endowment fund, however, in which he reports that given their tax-free status, they can rebalance daily, and attribute this to an additional return of 1.6% last year! Costs. The costs of your investments, when considered in the context of compounding over a long period of time, have considerable impact, i.e. it makes a big difference if the annual cost of your portfolio (through custodial fees, ETF/mutual-fund fees, etc.) is 1.7% versus, say, 0.4%. Taxes. Your tax structure and available vehicles for holding investments are important considerations. For many Americans, it may make sense, for example, to hold income-generating assets (like bonds) in tax-deferred accounts such as IRAs. Especially young people should educate themselves on the potential long term benefits of consistent investment. A number of asset classes (like stocks, bonds, and real estate) have historically delivered attractive rates of return. Diversification of one’s investments across loosely correlated asset classes both reduces risk while increasing return. Asset allocation, maintained through rebalancing, is the primary driver of long term portfolio returns. Historically, very few people (professional or otherwise) have been able to consistently forecast and beat the market. For this reason, most investment authorities recommend investing in asset classes that track broad markets as a whole. One can build and maintain a considerably diverse investment portfolio through ETFs, purchased, conveniently and for low cost, through a brokerage account. For anyone reading this article wishing to learn more, I would recommend the following introductory list of books and articles. Matt Henderson, Money for Something. This is a book that I authored, that can be purchased online, and takes about one hour to read.